Desare Lucido, 55, has lived at the St. John’s homeless encampment since July. Visalia City Council met with members of the Homeless Task Force and approved $10,000 in emergency funds towards a temporary winter homeless shelter. The shelter will be located at St. Paul’s Episcopal Church, 120 N. Hall St., and is expected to be up and running before the Valley sees freezing temperatures around the second week of December. This isn’t the first time Rev. Suzy Ward has opened her doors to the needy. Last year Ward used the church as a warming shelter with little to no entrance restrictions to the public. Unlike most shelters, Ward’s shelter did not require a drug test or any other obligations such as mandatory chores to stay overnight. The decision comes after an 800% rise in homelessness. Although the reopening of the emergency winter shelter at St. Paul’s was a step in the right direction, members of the Homeless Task Force don’t intend to stop there and have pushed for a permanent low-barrier homeless shelter in Visalia. District 3 Tulare County Supervisor Amy Shuklian, whose district encompasses Visalia, is the chair of the task force and has been considered a champion of the issue. She has worked with its members for nearly a year now to get the project on its feet. Recently, they spoke with Michelle Martinez, head of a low barrier homeless shelter in Bell. Martinez emphasized that although the facility ran year long, participants were not allowed to stay indefinitely. Typically, participants stayed a maximum of 90 days. The goal was to provide participants with the resources necessary to get off the streets and into permanent housing within that time period. The Homeless Task Force intends to emulate the shelter in Bell. But when and where the permanent shelter will be up and running in Visalia is still uncertain. Logistically and financially the project is challenging. The Bell shelter was lucky to find its home at an abandoned military base that held up to 500 beds. Regardless, operation costs were in the millions. Visalia doesn’t have any abandoned military bases lying around and with $6.4 million already going towards the homeless issue, the question becomes: Does Visalia have the resources to take on such an ambitious project? Homeless Initiatives Program Coordinator, Chaz Felix, who has spent his life serving the public and worked with homeless on skid row, is confident the community can work together to make the shelter happen without breaking the bank. To put in perspective the kind of collaboration going into this project: A homeless navigation center in San Diego has $5 million allocated to help the homeless find resources. According to Felix, Tulare County has accomplished the same thing with “no real cost” other than the operating cost of St. Paul’s. This is thanks to a collaborative effort with stakeholders such as the Local Initiatives Navigation Center, Homeless Alliance, and the Tulare County Health and Human Services agency. So far as the location for the permanent shelter, St. Paul’s has become the intended home by default. However, there are some community members like Vice-Mayor Bob Link who advocate for a shelter on the south side of Visalia. Other city council members like Phil Cox are more concerned about safety and the effect an emergency homeless shelter would have on the immediate neighborhood and its businesses. But Homeless Task Force members assured the council that security measures would be taken and patrols would be implemented in the immediate area to prevent conflict. In the end, the city council voted 5-0 in favor of funding the emergency shelter and has asked the Homeless Task Force to return for a more thorough discussion on long-term solutions. Visalia Mayor Warren Gubler emphasized that he understood the public’s concern moving forward with the council’s decision. Citizens less fortunate like Eugenia Palmer, also known as “Gemini,” who face the dangers of homelessness every day. Gemini is 54 years old. She’s a woman of faith with a taste for sweets and has been homeless since October 2nd. What started off as a visit to her brother’s ended in a series of unfortunate events and family betrayal leaving her without a vehicle, money, or anyone she could trust in a city she didn’t know. “No one ever did me wrong in the streets like my family did,” she said one night as she reflected on the circumstances that led her to becoming homeless. And that’s exactly what Gemini did. However, arthritis and bone deterioration in her knee and ankle severely limited her mobility, preventing her from seeking shelter. As a result, she spent most of her time confined to the side of the freeway. After my second interview with Gemini, she was robbed. Someone flipped her lawn chair over while she was attempting to stay warm and took her shoes and backpack which contained her ID and Social Security card. She claimed passersby watched it happen. The irony was that Gemini chose to stay out in the open because she figured she would be safe with other people watching. By this point I’d spent days speaking with Gemini. She was funny, had a loving nature, and I truly considered her my friend. I couldn’t bear the thought of her sleeping another night in such a cold and dangerous environment. So I asked Gemini if she would be willing to enter a shelter if I found her one. She agreed. I made some calls and found a couple of shelters in the area: The Lighthouse Rescue Mission and the Visalia Hope Rescue Mission. Both required a clean drug test and ability to walk upstairs and do chores. Gemini’s eligibility immediately came into question because of her obvious physical limitations. Initially, Gemini failed her drug test. It was discouraging but we didn’t give up. We returned a few days later and she gave a clean sample. She was officially in and we parted ways. Two days later, I received a call from her. She told me she was asked to leave the rescue mission. The conflict arose during one of their mandatory cleaning days. It’s unclear what exactly transpired between Gemini and the staff. I attempted to call her back, but Gemini used someone else’s cell phone. We lost touch with each other after that. My guess is that she’s still in the Tulare area and I hope that I can find Gemini again before freezing temperatures arrive. Although rescue missions like the Lighthouse do provide shelter and resources to a select few, their policies make it difficult for people like Gemini to receive help. Men, teenage boys, addicts, the physically disabled, for instance, struggle to find shelter in such establishments. This population makes up a large portion of the homeless who remain on the streets. Those with the ability to walk long distances may find themselves in large homeless encampments. 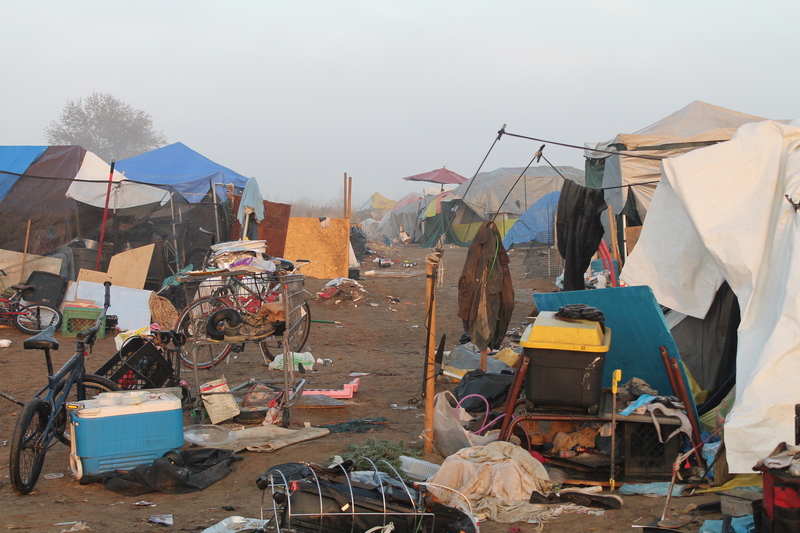 The largest of these encampments can be found west of the St. John’s trail in Visalia. Tents and makeshift huts fill the dried-up riverbed and its bank. Away from the public eye, this encampment offers some protection not found on the streets. It’s not uncommon for homeless to be harassed by locals or law enforcement. But even the encampments can only offer so much protection. Desare Lucido, 55, who prefers the term “houseless,” has called the encampment at the St. John’s her home since July. Throughout her stay, she’s experienced moments where strangers have harassed her and damaged her belongings. She recalled a particularly frightening night when a man circled her tent with a sickle, swiping at the ground and her tent with the bladed tool. That unsettling night forced her to step outside of her introverted nature and seek friendships within the encampment. She no longer sleeps alone. When asked about the community within the camps, she said many of the residents suffer from mental health issues and have failed to escape homelessness because its “generational,” implying some families have passed on the lifestyle to their children. And there are some, she claimed, who don’t intend on escaping homelessness and consider it a lifestyle with little responsibility. As for Lucido, she’s a lifelong Visalia resident who turned to the streets when her husband died and her most recent partner became physically abusive. She said she’d rather be at the encampments than the situation she was in before. Unlike some of her neighbors, she intends to get back on her feet, but has struggled to make progress. When asked what her biggest obstacle has been throughout all of this, she quickly blamed herself. 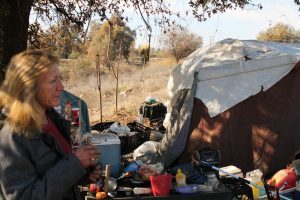 She admitted to having a problem with living in places with lots of rules, which has caused her previous involvement with rescue missions like Visalia Hope to fail. But she believes she will “get through it” despite herself and that she’s interested in a low-barrier shelter like the one at St. Paul’s. In our last moments together, I gave Lucido an opportunity to send a message to the public and she surprisingly chose to go with an apology. I admit it was difficult to look passed Lucido’s living conditions at first. But the more we spoke, the less her surroundings mattered. Under the right light, I saw glimmers of the person she used to be: A daughter. A loving aunt. A well-kept woman and a proud wife to her late husband. I realized that’s exactly the kind of understanding Gemini was talking about. For the moment, Lucido is surviving. She has neighbors who protect her and kind strangers who bring her food, but encampments do little against other threats like pests and diseases such as scabies, hepatitis A, and tuberculous. Not to mention the notorious Central Valley freeze that is just around the corner. Four homeless whom Ward was working with have died due to one or more of the threats mentioned. And with homelessness rising every year, it has become a high priority to establish a long-term solution for the growing population. For now, the Homeless Task Force and its stakeholders are in a “mad rush” to get the permits, resources, and volunteers ready for the emergency winter shelter at St. Paul’s Episcopal Church early this month. For information on volunteering or donations call Rev. Suzy Ward (559) 627-8265.